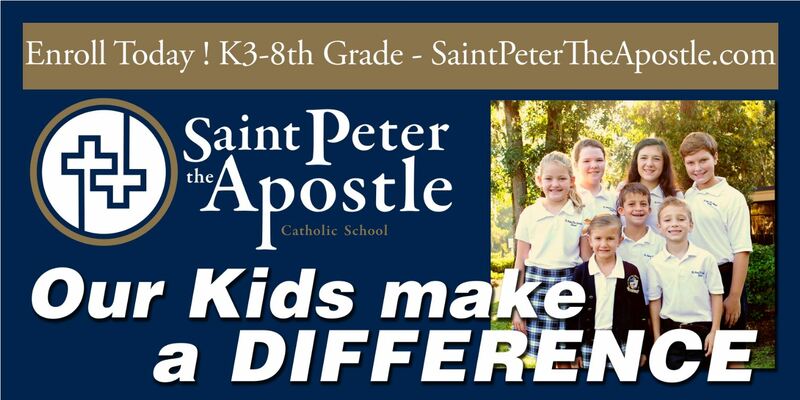 Love and compassion for others lies at the heart of all we do at St. Peter the Apostle. Service learning is an important aspect of everyday life which encourages students to fully live the Gospel call to love everyone. Service learning includes meaningful service projects, student planning and implementation of service activities. Schoolwide Community Service Projects during the month of January and ending during Catholic Schools Week each year. Advent Angels Project: St. Peter’s collects hundreds of dollars each Advent through various fund raisers. With the donations we are able to help school families in need have a Blessed Christmas. Canned Food Drive: The Student Council and National Junior Honor Society sponsor a Food Drive each November. Kids Heart Challenge/Jump Rope for Heart: Each February, St. Peter the Apostle participates in this American Heart Association fundraising event whereby students jump rope, exercise and learn about heart health and raise money for the AHA. Recycling at SPA: Aluminum cans are recycled and monies collected are put towards fundraising efforts.